Erneuern @ Coniferidge ... Neubau in einer wunderschönen Waldlandschaft. Wir bauten dieses kleine Haus auf unserem Grundstück, um die Leute in der wunderschönen Gegend zu begrüßen, in der wir leben. Unsere Lage ist nah an vielen Orten, die man gerne erkunden möchte. Eine wunderbare Auswahl an Weinbergen und historischen Orten liegt in unmittelbarer Nähe. Dieses neu erbaute Studio bietet einen ruhigen, sauberen einfachen Raum, alle weißen Dekor und komfortable moderne Mix-Ausstattung. Es liegt eine kurze Strecke vom Haupthaus und bietet nur die Privatsphäre, die Sie suchen. Das Hotel liegt in der wunderschönen Charlottesville Va ist eine einfache Fahrt zu Restaurants, Einkaufsmöglichkeiten, Kunst, Kultur, Weingüter, Geschichte, Parks und der University of Virginia. Also, ob Sie für eine Veranstaltung oder einen Ausflug besuchen, kommen und genießen! Wanderung zum Rivanna River durch Fernbrook Natural Area. In der Nähe Preddy Creek Equestrian Trail und Mountain Bike Trail. Weinberge Minuten entfernt: Horton, Burnley, Barboursville. 30 weitere Weinberge in der Umgebung. In der Nähe von Monticello, Montpelier und Ash Lawn-Highland Präsidentenhäusern. Bürgerkriegsgeschichte. Blue Ridge Berge. Skyline fahren. Gehen Sie zu Fernbrook Vogelschutzgebiet und Naturwanderung. Ein lokaler Markt ist weniger als 8 km entfernt. Sie können uns auch auf Instagram bei Coniferidge finden. RAUCHEN VERBOTEN Keine Haustiere (wir haben einen Hund und zwei Bobtail-Katzen auf dem Grundstück) Die Hütte liegt gegenüber unserem Haupthaus gegenüber der Auffahrt. We loved our time here. The place was modern, bright, and clean. Not your typical “country cookin” mountain place. We are very happy to have found it. The location was very peaceful too. Loved the super clean, brand new small house. Luxurious! High speed internet worked great. Microwave and toaster oven. Within view of the main house on the property but far enough away for privacy and silence. In a grove of beautiful pines that kept me company. I would definitely visit again. We had a great weekend away at the Coniferidge cabin. It’s the perfect getaway weekend getaway house. The location is central to downtown Charlottesville and local wineries. I would love to stay here again. Coniferidge is just stellar, could not be better. My wife and I spent a long weekend at this wonderful little cabin in the woods. Steven and Amy are gracious hosts, their property is beautiful, and the cabin really needs to be seen in person to aptly describe how special it is. If you must have internet it is lightening fast but if you can tear yourself away from being connected for a weekend (or a week!) 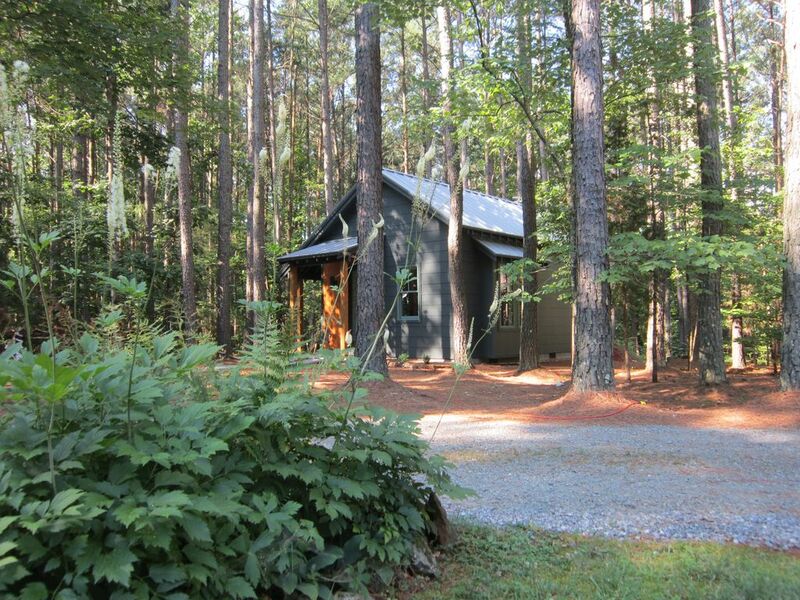 it is a great place to just chill out and admire the beauty of a Virginia forest. Charllotsville is a very interesting city, there are a ton of things to do, great restaurants, a lot of history, Monticello is nearby (and well worth the cost), and UVA is a gorgeous campus with a lot of history in it's own right. One thing we must mention are the towels in the bathroom. While this might seem strange to most people, we live on a sailboat and we are mostly forced to use wimpy quick drying towels. Hence we almost never get to use 'real' towels and Amy has supplied some of the thickest and most luxurious towels we can ever recall. We were tempted to take extra showers just to use the towels! And if you happen to arrive late and don't get to the store, not to worry, as there was plenty of stuff that breakfast for two was not a problem at all. We are already discussing when we might have an opportunity to return. Highly, highly recommended, there are not enough good things to say. By far it is the best, and most interesting, property we have ever stayed at. Thanks Steven and Amy for making a weekend that was going to be special no matter what (we got to see our son for the first time in two years) totally perfect. This home is immaculate and beautiful. While only a short drive from downtown, we were pleased to feel far from the hustle and bustle of city life. The house is nestled in the woods with beautiful farm and mountain vistas at the top of the driveway. The owners have thoughtfully provided many "extras" like snacks, yogurt, fruit, dvds, and chilled glasses. There is also a cute outdoor sitting area lit by globe lights, where we enjoyed morning coffee and wine at night. Hiking trails are located within a short walk, as well as a great tree swing with a pretty view. This is a special property. I highly recommend it! Wanderung zum Rivanna River durch Fernbrook Natural Area. In der Nähe Preddy Creek Equestrian Trail und Mountain Bike Trail. Weinberge Minuten entfernt: Horton, Burnley, Barboursville. 30 weitere Weinberge in der Umgebung. In der Nähe von Monticello, Montpelier und Ash Lawn-Highland Präsidentenhäusern. Bürgerkriegsgeschichte. Blue Ridge Berge. Skyline fahren. Gehen Sie zum Fernbrook Vogelschutzgebiet. The door is Pella . To lock the door you pull up on the handle to secure the three way mechanism then turn the key or from the inside the small knob below the handle. We have a dog on the property ( she is on a radio fence) she stays out of the way and is best left to herself. There are also two bobtail cats that roam the property but are very shy of people.